Stefan Blachfellner represented the BCSSS together with Helene Finidori at the first summer school program by the Montparnasse Initiative – School of Thinking, which was hosted by the Center for Research and Interdisciplinary (CRI) in Paris, France from 12th to 18th July 2018. The summer school focussed on the exploration on thinking itself as the background activity underpinning all knowledge and action and invited its participants to challenge themselves and others to think freely, independently, critically, and creatively. Stefan Blachfellner and Helene Finidori took part in this co-creation of a new programme of experiential learning and contributed to it with several lectures. One of the main section Stefan presented dealt with the core principles of systems thinking. He introduced the origin and present of the systems worldview, epistemology and applied systems thinking. Stefan explained the difference between the scientific method and research design regarding individuation. While the scientific method is rooted in a pre-structure, systems thinking thrives more from heuristics. Moreover, systems science emphasizes relational networks that form holistic units. When discussing the nature of systems Stefan explained that systems are organized in structural and functional hierarchies that operate at multiple scales of reality and at multiple levels of complexity, that they evolve across time by encoding information that can be received or sent internally and with other systems and, last, that systems are regulated by internal subsystems and also contain models of other systems in their environment. The session was closed with some insights about the practitioner, thus, the observer in systems science, who is conceived of as within a loop relating to a situation with an interpretation of the situation through a framework chosen by the observer and interacting with a methodology again chosen by the observer to enhance the understanding of the situation. Helene Finidori, leader of the BCSSS research group on Pattern Literacy contributed with her session on Pattern Thinking. Helene showed how patterns within images are open to a multiplicity of interpretations and the power of subjectivity to abstract patterns and create stories/narratives in several exercises with the group. Playing with pattern interpretation can be important for self-exploration and discovery to be expressed on an individual emotional level and a collective political level. Patterns are how we perceive the world, in our own minds and in the minds of others, enhance collective understanding and connect different forms of agency, thus pattern thinking is about sense-making, decoding/encoding our inner worlds and our boundaries with others. Patterns are the matter of our thoughts, the key elements to learning new information and they can help us gain a clearer understanding of systems and complexity, on many different dimensions, levels and scales. Patterns can help us make new connections, form new creative ideas and allow us, escape negative habits and build positive habits. Her session closed with the insight that learning how to handle differences in processes of convergent interpretation requires an art of distributed thinking and open conversation. 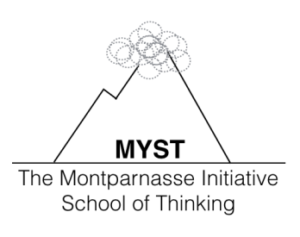 Stefan and Helene assessed the first Summer School of Thinking by the Montparnasse Initiative as a very inspiring event and an important step in the cultivation of new thinking and are thankful to the initial group which started the initiative.